Become a manager of your own supermarket! 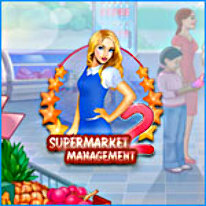 A sequel to Supermarket Management, this charming time management game is loaded with a gripping storyline, vivid graphics and challenging gameplay. Quickly serve clients and earn coins, invest them and let your business grow. You are going to learn many things: how to make sales, how to settle disputes and how to use innovations. Your efforts will be rewarded after each completed level - just play and see!